Remember that picture with those different sized cases? 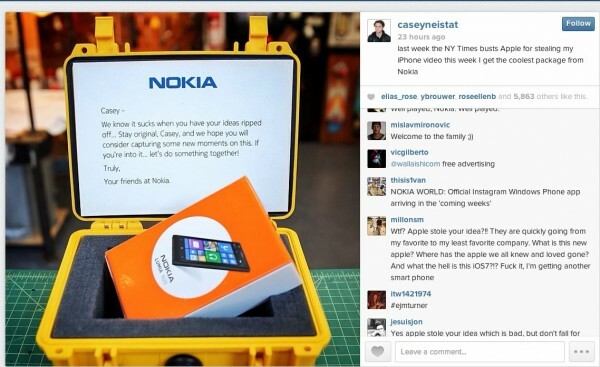 Inside one seems to be a Nokia Lumia 1020 which was sent to Casey Neistat. He recorded a video with his iPhone which Apple used, but removed his name without permission. Apple was busted on NYTimes for this. Nokia, as a kind gesture (and good social media move) gave him a Nokia Lumia 1020. Well if it’s worth taking a video, why not with a 1020? Apple is famously quoted for “Good artists copy, Great artists steal” originally by Picasso but more famously associated with Steve Jobs. Steve hated Android for copying Android and wanted to annihilate it, but iOS has so much copied from everywhere too. It’s a cycle of life where one inspires another (Sammy is the best at getting inspiration from others). Nokia’s had a lot of inspiration at Apple too (though we won’t go there).